Sorry, I had to go a little Andre3K on ya. I'm taking a little creative liberty this weekend, and deviating from the wash and go in honor of Valentine's Day. Truth telling time: Samuel won't let me cuddle and lay on him when my hair is wet. He loves my wash and go's, but does not relish wiping curl goop off of his shirt or jacket. So to appease him, and make sure I get ALL the boo lovin' time, I decided to switch up my style and do a Curlformers set, using the CURLS Blueberry Bliss Reparative Leave-In Conditioner and Curl Control Jelly to hydrate, nourish, eliminate frizz, enhance shine, and provide touchable hold and definition. Because I'm extra fancy in 2016, you guys already know there's a video demo companion. WARNING: Super cute curly realness ahead. Check your local Target here! Cetearyl & Cetyl Alcohol: Considered "fatty alcohols" -- NOT to be confused with drying alcohols such as ethyl. Acts as a lubricant, thickener, and emollient. Also gives conditioner its velvety feel without making hair greasy. Is additionally used to keep product ingredients from separating. Certified Organic Blueberry Fruit Extract: Antioxidant-rich extract that reverses signs of damaging and aging in dry, damaged, over-processed hair. Blueberry extract also shows promise in promoting hair growth. Certified Organic Coconut Oil: Oil high in saturated fats (which is why when cold, it is solid). One of the few known oils to penetrate the hair shaft and truly moisturize hair. Coconut oil helps to moisturize, seal, and prevent breakage. Glycereth-26: Glycerin-based oil used as an emollient, lubricant, and thickening agent. No. The Reparative Leave-In Conditioner contains hydrolyzed quinoa. First of all, the smell. Sweet Jesus, the smell. I absolutely LOVE the smell of both products, honestly. I knew I was in for a treat when I used the Blueberry Bliss Curl Control Paste on my edges some time ago (maybe over a year?). It's sweet, Jolly Rancher-esque, and just gives me life over and over again. It's not an overbearing fragrance, and it doesn't really linger in the hair. I appreciate the literal blueberry bliss that I receive every time I open the bottle. Beyond the fragrance, the Blueberry Bliss Reparative Leave-In has thoroughly impressed me for a number of reasons. The slip is off the chain. As you can see in the video, I am gliding my Eternally in Amber comb through my curls with absolute ease. My curls are definitely sucka free with the Reparative Leave-In. I'm also impressed with the level of moisture it provides, without weighing my hair down or making it feel greasy -- and you see in the video how much product I used! I'm also incredibly impressed by the presence of blueberry extract so high on the list. You know how some brands "name drop" ingredients in their labeling, fragrance, and color, but on the ingredient list it's dead last, if present at all? The Reparative Leave-In is NOT the one. It's an active ingredient, and I'm absolutely here for it! All in all, it's everything I want in a leave-in conditioner, and more. CURLS definitely knocked it out the park with the Blueberry Bliss Reparative Leave-In Conditioner! All. Systems. GO! 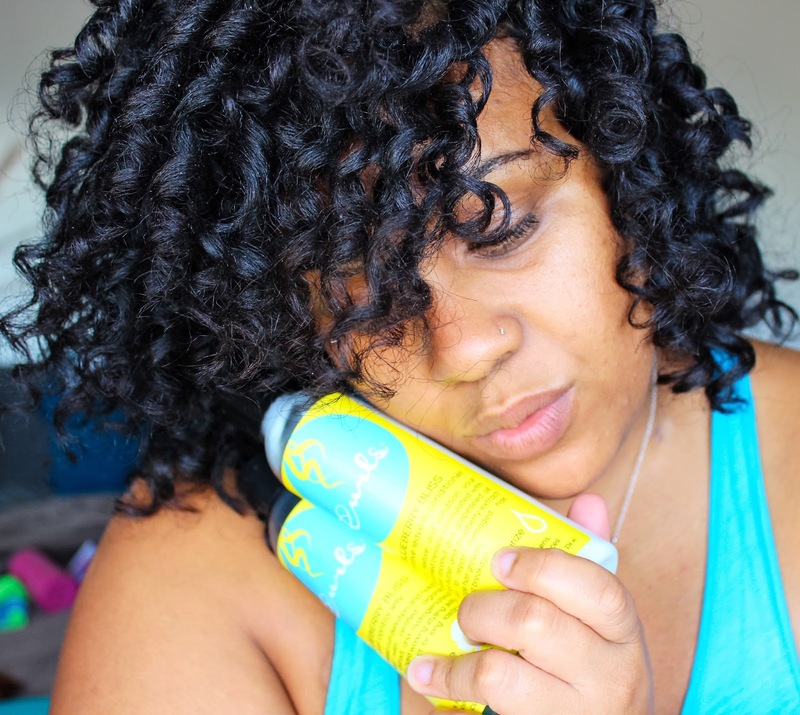 It's intensely moisturizing, strengthening (no breakage in the takedown or installation of my Curlformers...yasss! 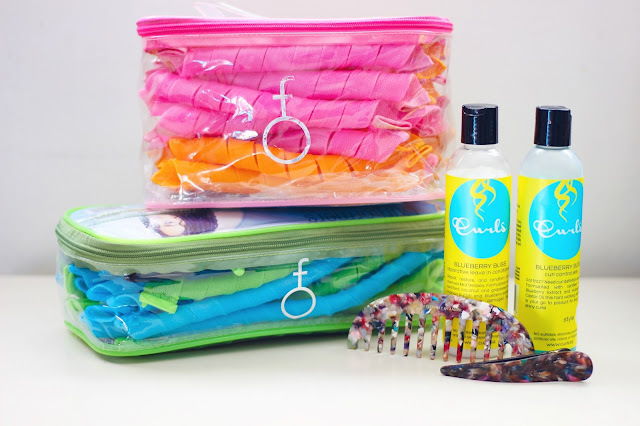 ), and provides shine while easing frizz and serving detangling realness. I couldn't ask for more. Definitely keeping this in rotation in 2016! Blueberry Leaf Extract: Antioxidant-rich extract that reverses signs of damaging and aging in dry, damaged, over-processed hair. Blueberry extract also shows promise in promoting hair growth. Polymide-1: Styling resin for gels, alternative to PVP. The Blueberry Bliss Curl Control Jelly carries the same fragrance as the leave-in, and you already know how I feel about that. I'll admit, I didn't know what to expect with the Curl Control Jelly -- I was wondering if my Curlformers were going to come out sticky, crunchy, and stiff. I am BEYOND thrilled with the performance of the Curl Control Jelly, because... LOOK! Honestly, I'm a fan. I thought long and hard and tried to find a way to not like the Curl Control Jelly. I've got nothin'. If you're looking for touchable hold that actually, like, really lasts, Blueberry Bliss Curl Control Jelly is definitely the way to go. Not only does it lay the hair smooth, provide touchable definition, and shine, the results are long lasting. My curls are standing the test of time (without me doing much of anything to preserve them). My curls aren't dried out or frizzy after sleeping on them, and that's a total win. No refreshing, no oils, no butters. Just winning all the way around! 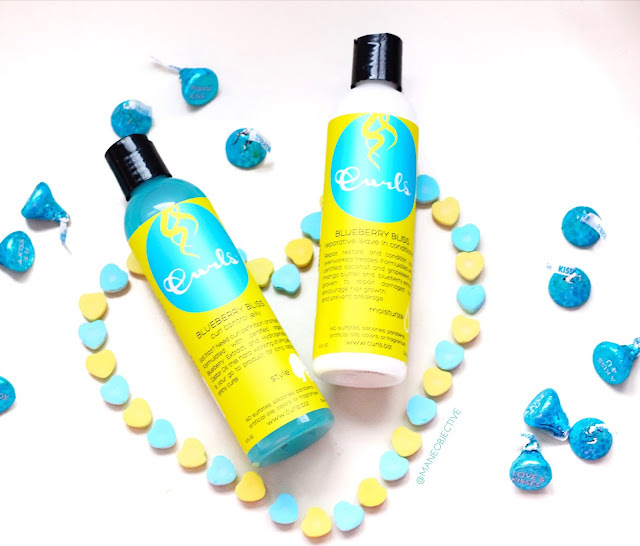 Have you tried CURLS Blueberry Bliss Reparative Leave-In Conditioner and Curl Control Jelly? Let me know how you liked them in the comments! Soooo beautiful! I love this style on you...and I need that leave-in!!!! Thank you!!! And yes, the leave-in is AMAZING! 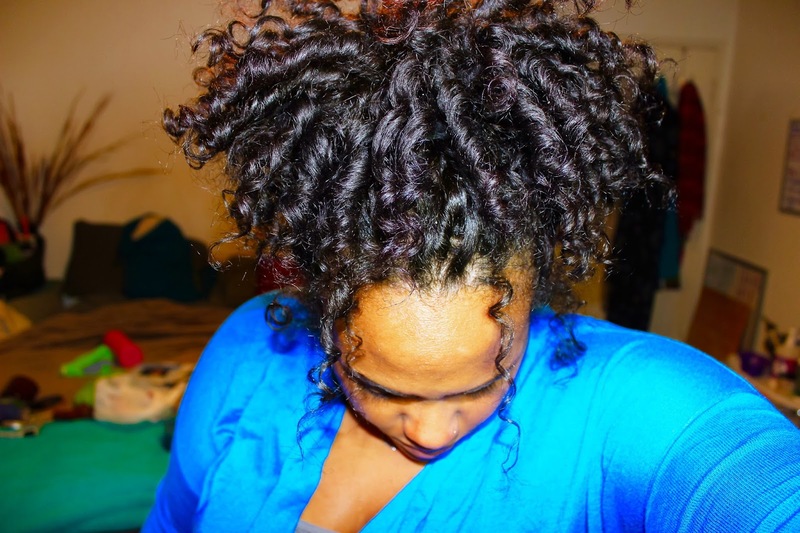 Would you use the blue berry gel in a wash and go? With the consistency of it, I would definitely only save this gel for styles like Curlformers and braidouts. I like my gels to be on the heavier/thicker side, and the Blueberry Bliss Curl Control Jelly is definitely lightweight. 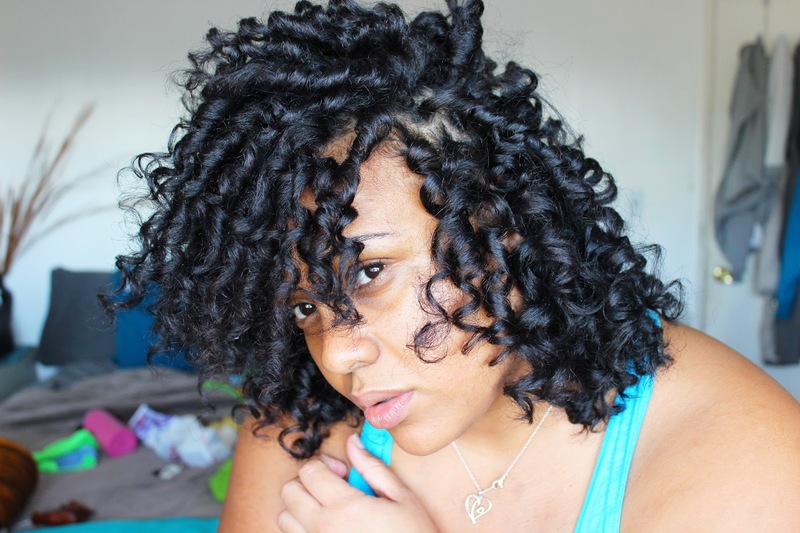 Softer curl patterns can likely get away with using it for Wash & Go styling. Hi Christina! Which leave-in conditioner do you like better: Curls Blueberry Bliss Reparative Leave-In Conditioner or Mielle Organics Avocado Hair Milk?